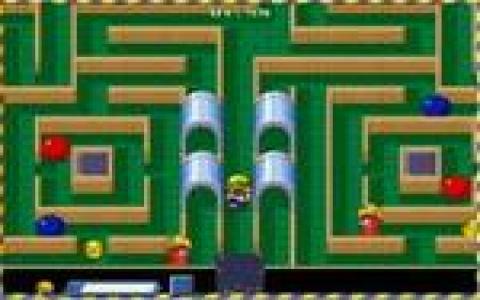 The developer of this game, Yamada No Ana Project really loved old arcade games, of the kind that gave you a top down maze, and then had a task for you to complete, while under the constant threat of enemies and always with some puzzle in there, for good measure. 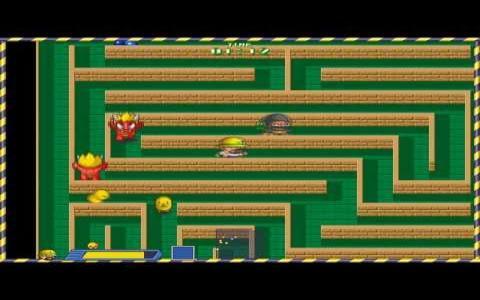 Thus, Doka-Chan no Oni Gokko is a retro looking, arcade in build top down puzzler/action game, with a lot of different game worlds to go through, each one with its own set of challenges and original content. Graphically, it looks like a game that was made for the SNES console, or, rather, like a DOS game that was originally produced for the Super Nintendo Entertainment System. So, your main goal in game is to catch the chicken that have scattered in the game's mazes. It can be quite a daunting task, but it's definitely not that hard, to the point where you can't get it done. There are also baddies to avoid and puzzles to solve, mainly based around finding ways to go through the maze, unlocking certain areas in there. So, all in all, Doka-Chan no Oni Gokko is a true arcader, reminiscent of Pac Man but loads more complex. Plus, it runs great on XP and later OSes from Windows, which is always great.